In 2017, the fifth anniversary of the VGGT highlighted their successful integration into national law and decision-making processes across several countries. The uptake of the Guidelines has steadily grown in the past five years, aided by the development of tools and resources and further supported by an umbrella program at FAO that has carried these processes forward in 60 countries. Currently, there is no official monitoring or implementation assessment framework for the VGGT. While global frameworks such as the VGGTs and SDGs have established clear objectives towards improved land governance, questions on how to monitor progress towards these goals and evaluate the impact of related interventions remain unanswered. In fact, the VGGTs call on States to establish multi-stakeholder platforms that would monitor implementation, while the SDGs include a clear mandate for data collection to provide "high-quality, timely, and reliable data" that reflect local contexts. Responding to this call, the last five years have seen a range of monitoring and data generation initiatives and tools blossom. Despite these numerous initiatives, key information about if and how countries are adopting the VGGT remains fragmented, difficult to locate, and is not easily accessible or usable. This has made it challenging to track and monitor who is doing what in terms of VGGT implementation. It is with this in mind that the Land Portal has created a platform devoted to consolidating data and information on the VGGT. A significant amount of VGGT-related information is already published online on the Land Portal. However, this global online hub will ensure greater accessibility and use of a wide range of VGGT-related documentation through improved knowledge sharing at all levels. The VGGT platform aims to track data and information that relates to VGGT implementation, provide open access to a wide range of VGGT related documents and organize this wealth of contents to facilitate understanding, access and reuse of this information. This platform is the result of feedback provided by land tenure experts and organizations with a long history of experience in the land governance sector. 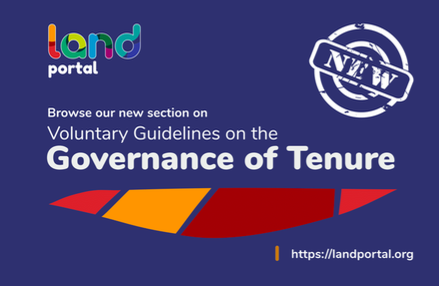 The structure of this portfolio integrates the feedback provided by land tenure experts and organizations with a long experience in the land governance sector, which makes it the result of a collaborative and high-level consultation effort. The VGGT is a long and complex document. Both the monitoring and implementation of the guidelines is no easy feat. Our goal is to provide a dynamic and up to date overview of existing information on the VGGT that reflects its complexity in easy to understand ways.